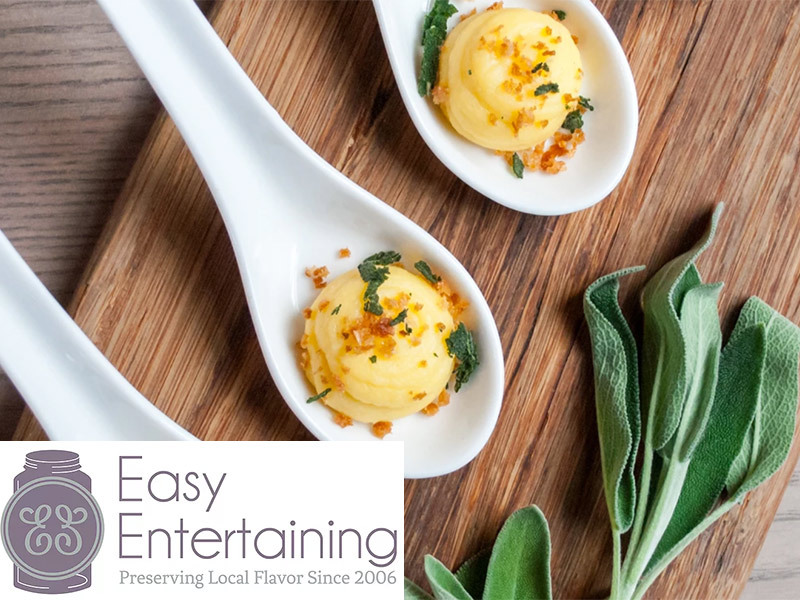 Take a peek into Market Mobile each week to see some of the local food on offer and get a taste of the wide range of restaurants, schools, grocers, and other businesses sourcing local in our community — like Easy Entertaining, a catering collaborative and café in Providence. Join us for the largest indoor farmers market of its kind in New England every Saturday through April, 9am to 1pm. 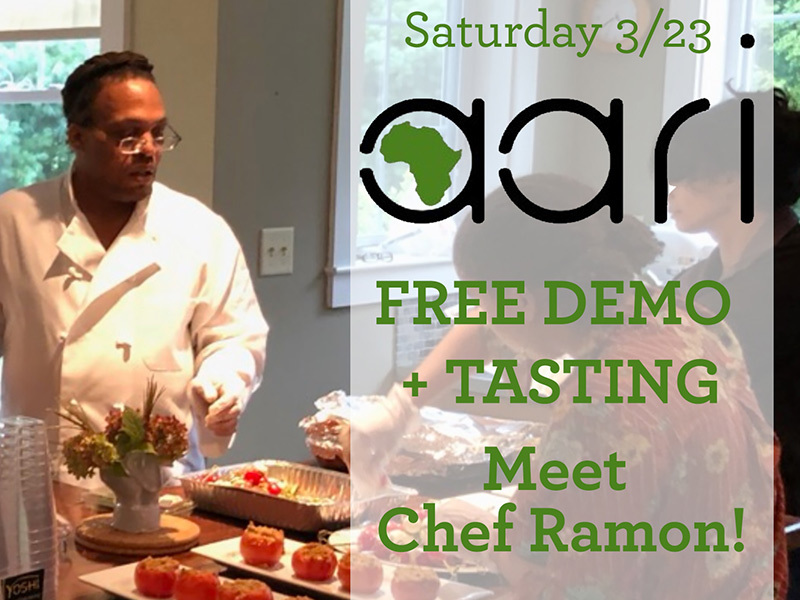 MARCH TO SPRING MONTH continues tomorrow with a free demo and tasting by African Alliance of Rhode Island. Our *Who’s Hungry Games* continue… play all month long for your chances to win farmers market prizes. 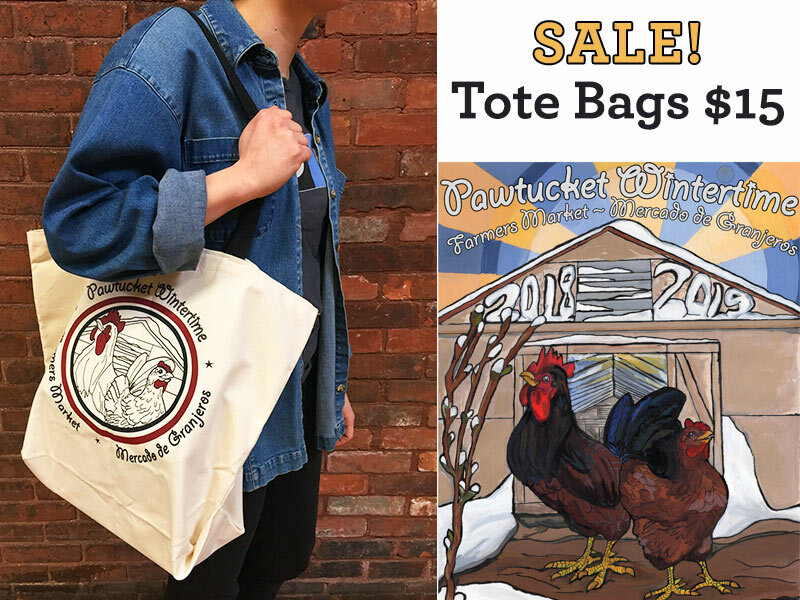 And bring home a piece of this season’s market with a tote bag — now on sale for $15! 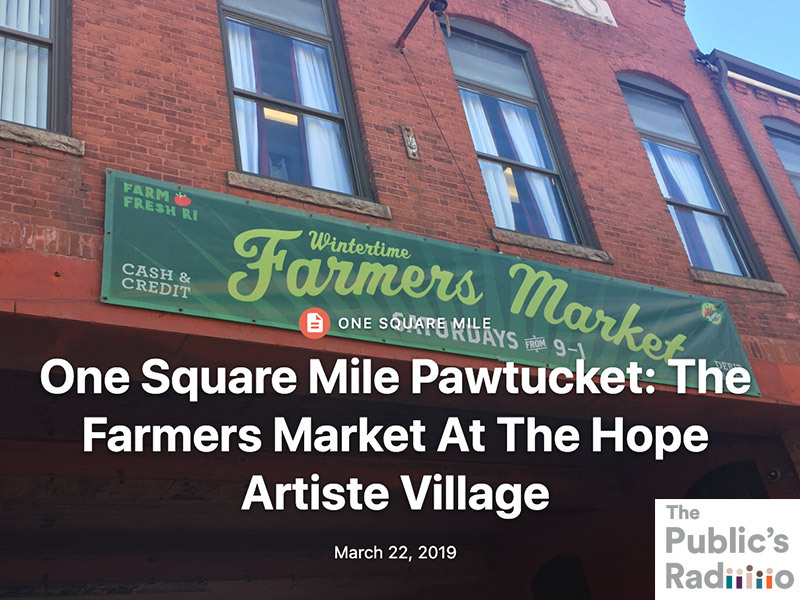 RI Public Radio has been doing a series of stories on Pawtucket, called “One Square Mile” — today’s feature takes a trip to our Pawtucket Wintertime Farmers Market! 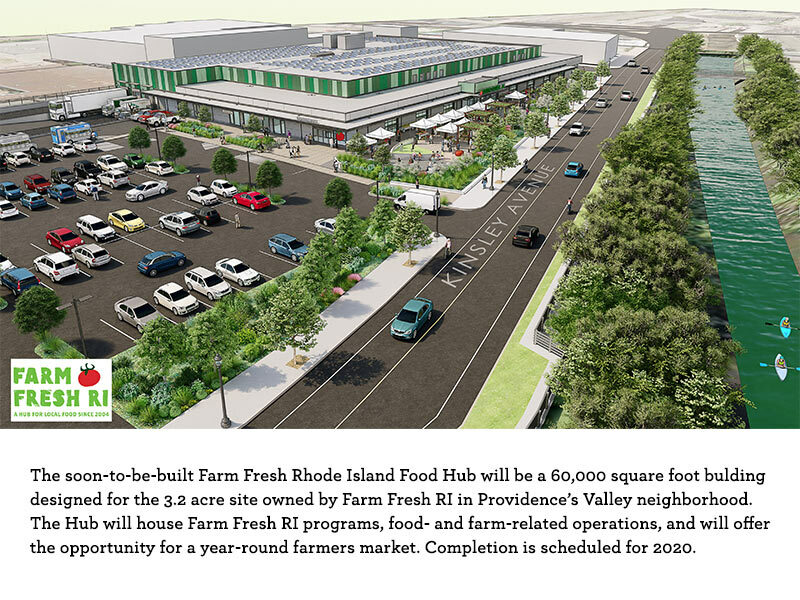 Don’t miss this food system news from around our region: Should You Add A New Product Line? 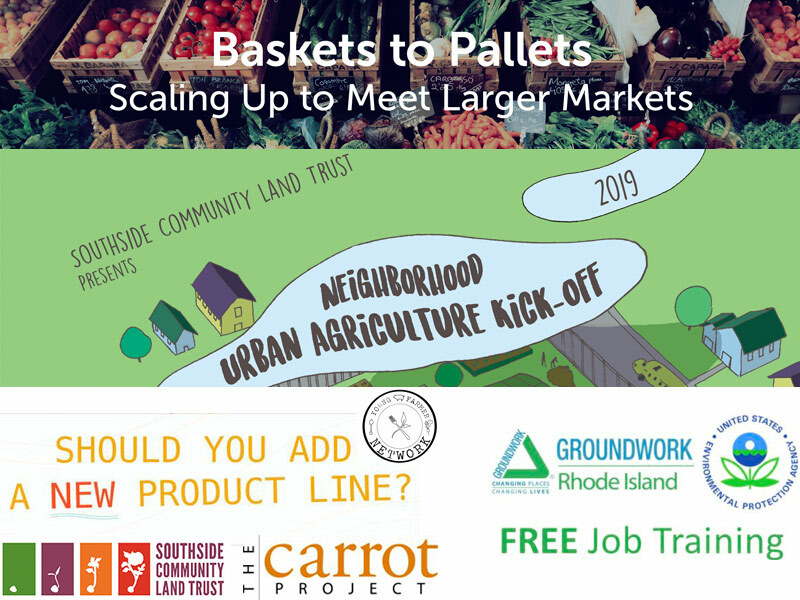 The Young Farmer Network, Southside Community Land Trust (SCLT), and The Carrot Project are ready to help! Are you in search of new markets? Attend “Baskets to Pallets” to learn about scaling up to meet larger markets. Groundwork RI is hosting a free job training program beginning in April. And SCLT is holding its annual Urban Agriculture Kick-Off April 13th! 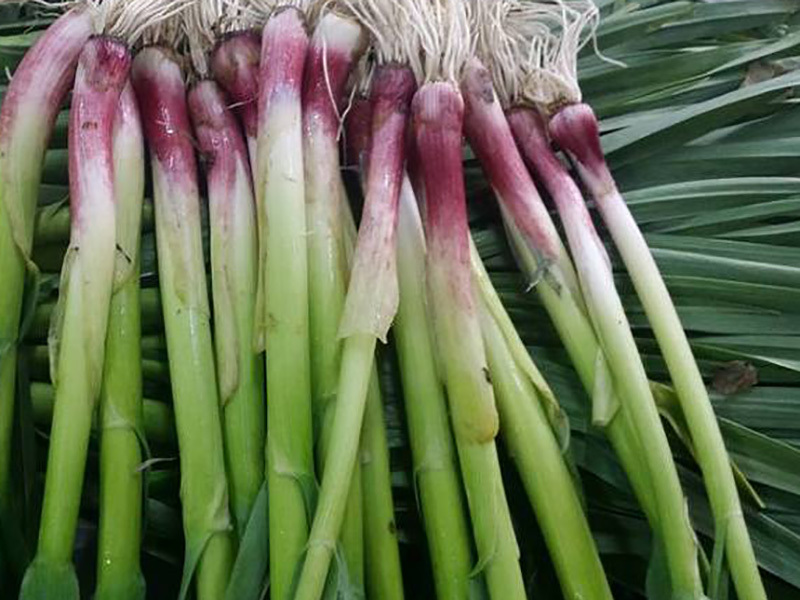 Take a peek into Market Mobile each week to see some of the local food on offer — like green garlic from Cook’s Valley Farm in Wrentham, MA — and get a taste of the wide range of restaurants, schools, grocers, and other businesses sourcing local in our community. Join us for the largest indoor farmers market of its kind in New England every Saturday through April, 9am to 1pm. 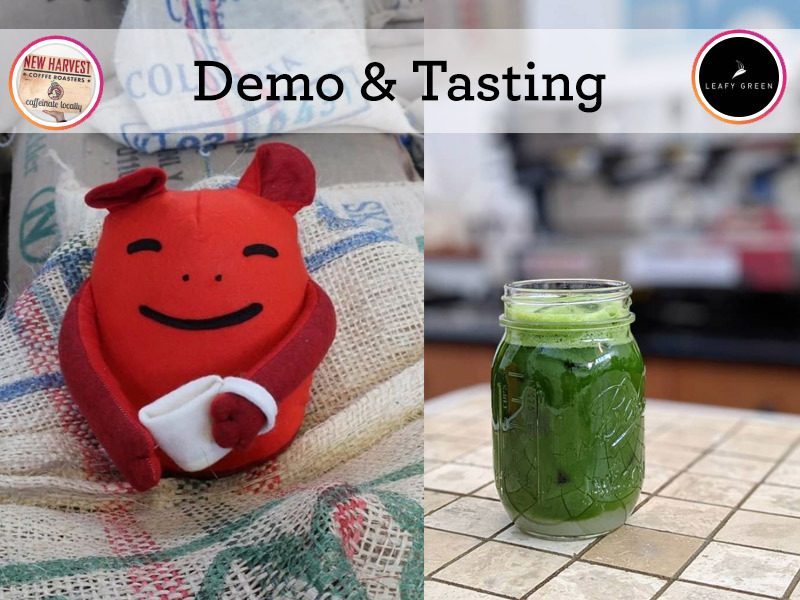 MARCH TO SPRING MONTH continues tomorrow with a free demo and tasting by New Harvest Coffee Roasters and Leafy Green Tea (Yuzu Matcha Sparkler!). Plus, our *Who’s Hungry Games* continue… play all month long for your chances to win farmers market prizes! Did you realize you are supporting your local dairy farmer when you encourage students to choose milk? Our Farm to School program is highlighting local dairy as our “Harvest of the Month” for March. 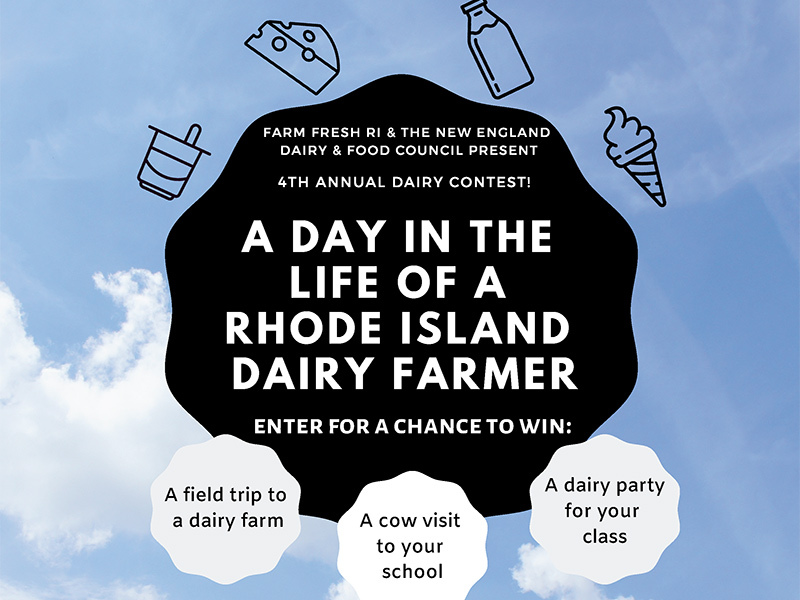 We are pleased to announce that the New England Dairy & Food Council is collaborating with us to help you celebrate local dairy farmers all March long! Don’t miss this food system news from around our region: Food safety inspections on produce farms are beginning this month, but there are still questions as to what the first round of Food Safety Modernization Act (FSMA) Produce Safety Rule (PSR) inspections will look like. Learn more about what to expect from NSAC, and attend one of 3 FREE PSR Workshops offered by RIDEM. NSAC is hiring. Boston Local Food Festival Registration is Open — and early-bird vendors can save $50 on their booth fee! 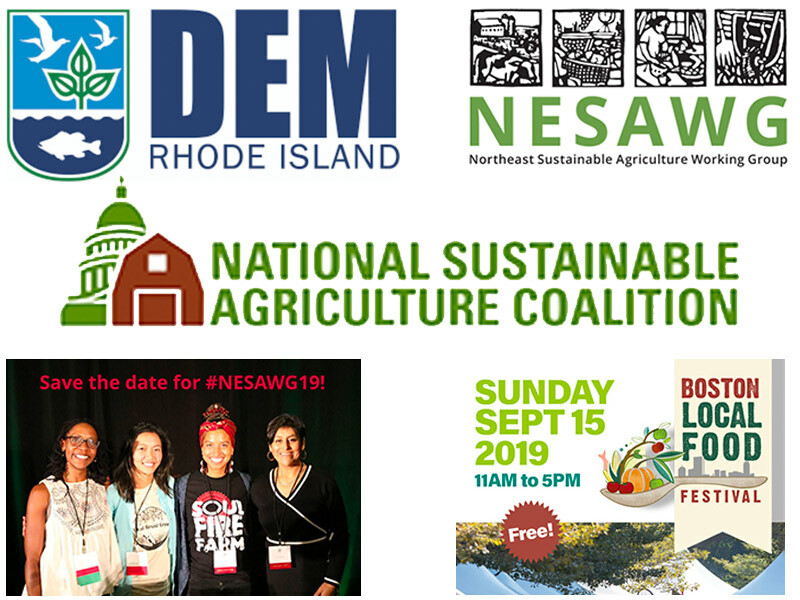 Plus, save the date for NESAWG’s “It Takes a Region” Conference! 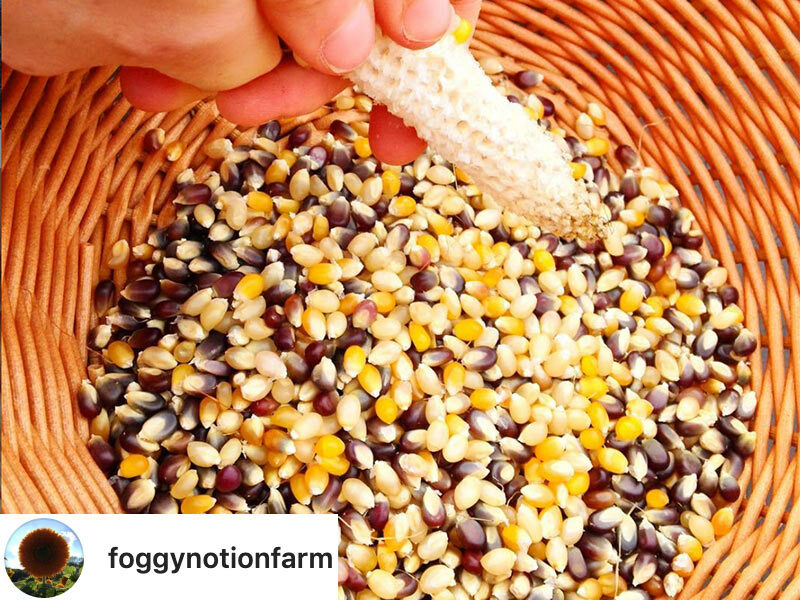 Take a peek into Market Mobile each week to see some of the local food on offer — like colorful confetti popcorn from Foggy Notion Farm — and get a taste of the wide range of restaurants, schools, grocers, and other businesses sourcing local in our community. Celebrate the start of the local growing season this spring with the arrival of asparagus! Join us at Four Town Farm for a special afternoon enjoying this locally grown delicacy prepared by Johnson & Wales Chef-Instructors — and pick your own pound to bring home! 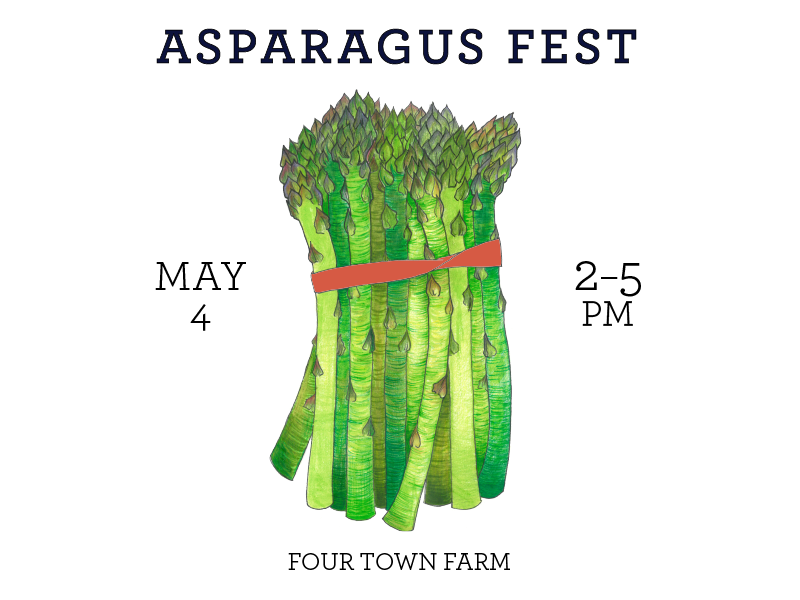 Book early to get a seat on the guided tour through the asparagus fields! Join us for the largest indoor farmers market of its kind in New England every Saturday through April, 9am to 1pm. 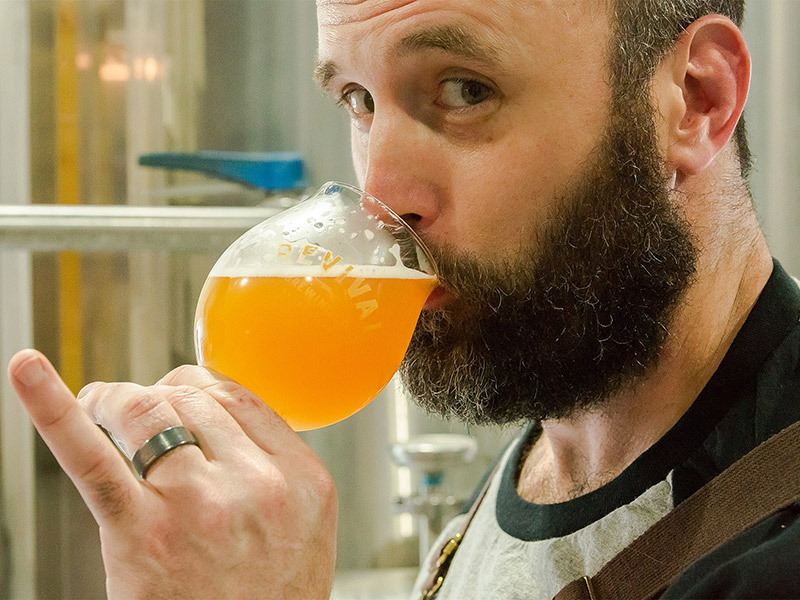 MARCH TO SPRING MONTH continues tomorrow with a free BEER TASTING by Revival Brewing Company. And our Who’s Hungry Games continue… play all month long for your chances to win farmers market prizes! 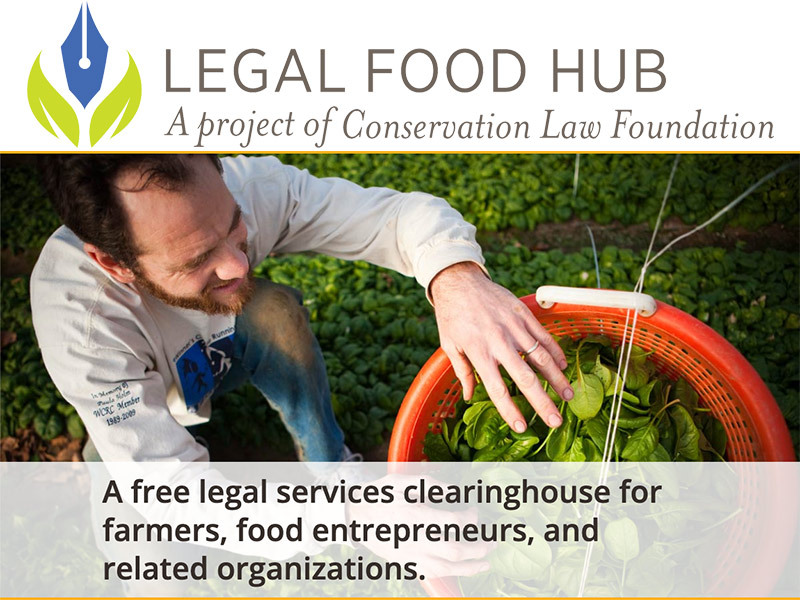 Don’t miss this food system news from around our region: The Legal Food Hub is pleased to invite you to the final two webinars of its Winter Webinar Series for farmers, food entrepreneurs, food-focused organizations, and anyone else who has an interest in the legal framework of the food system.